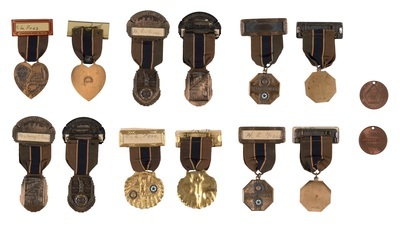 "Henry L. Foss's Military Medals"
Henry L. Foss's Military Medals: Top Row Left to Right- 1) Name tag reads "H. L. .Foss" "Lewiston Post No. 22", heart shaped medal, "18th Annual Convention June 25-28 1936, American Legion", "The Industrial Heart of Maine Lewiston", "Dept. of Maine", on the back it reads "THE WHITEHEAD & HOAG NEWARK N.J." 2) "19th National Convention" "H. L. Foss", "1937 New York, American Legion", on the back "Up Fifth Avenue Again in 1937"; 3) Name tag empty,"Education", "1938", "Recreation", "American Legion", "Waterville", "American Legion Auxiliary", "ME," on the back "Robbins Co. Attleboro"; 4) "Supreme Lodge", "Knights of Pythias", "European War Medal", on the back "Knight, Henry L. Foss, Member of Lodge No. 79 Domain of Maine". Bottom Row Left to Right 5) "19th National Convention" "Mrs. Henry L. Foss", "1937 New York, American Legion", on the back "Up Fifth Avenue Again in 1937"; 6) Name tag reads " H. L. Foss", shell medal reads "Dept of Maine", "American Legion", "American Legion Auxiliary", "19th Annual Conv 1937", "Old Orchard Beach" on back it reads "Robbins Co. Attleboro Mass"; 7) Name tag reads "H. L. Foss", "Education", "1938", "Recreation", "American Legion", "Waterville", "American Legion Auxiliary", "ME," on the back "Robbins Co. Attleboro".